The level of general care you will need to give your cat will depend on its breed, length of fur (or lack of it), its health, and its age. There is not a great deal to do with short haired breeds as they can keep their coats in tip top condition with little or no help although it is always worth giving them a groom every now and again. There is more work to be done with long haired breeds and a great deal with Persians which have a very thick undercoat as well as a long top layer of hair. 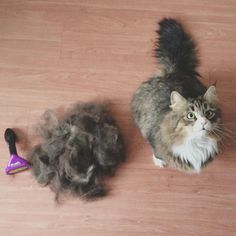 We love the Furminators here at Casts Whiskers! Next time you’re in, why not ask for a demonstration! This tool takes out all the dead hair, very gently and easily and also helps to prevent hairballs as the cat will not be ingesting all that fur! 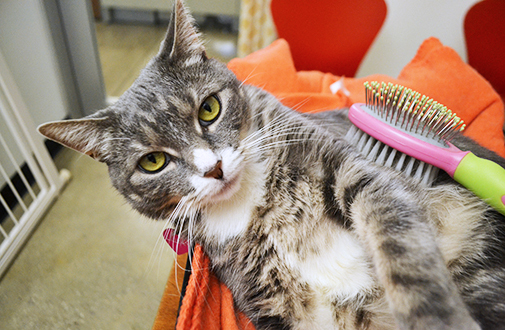 We recommend combing with a fine-toothed comb every so often to check for flea dirt and to monitor the skin condition. Most cats do not need any help with their eyes – everything is kept clean with regular grooming. However, the very flat faced breeds such as Persians and Exotics have been bred with skulls which are not the normal cat conformation. Often the tear ducts (which let the tears which lubricate the eye drain away without anyone noticing) have had their path blocked by changes to the shape of the skull. The result is that the tears overflow down the face causing staining and probably discomfort for the cat. The dampness can cause skin problems too. Gently wipe with a cotton wool ball dampened with clean water. Use a separate ball for each eye and dry with a soft tissue. Do not touch the eyeball as this will be painful and the cat will try to avoid the experience next time. Most cats love having their faces washed too! If you think your cat’s ears are grubby it might be tempting to clean them out with a cotton wool bud. However this is not a good idea as the tissues lining the ear canals are very delicate and easily damaged. Ears may be dirty because there is wax but it may be caused by ear mites or a skin irritation. 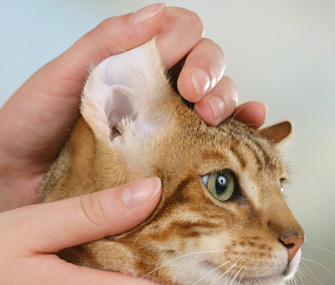 Check with our vet or nurse who may give you a product to wipe out the outer ear or show you the best way to do this. 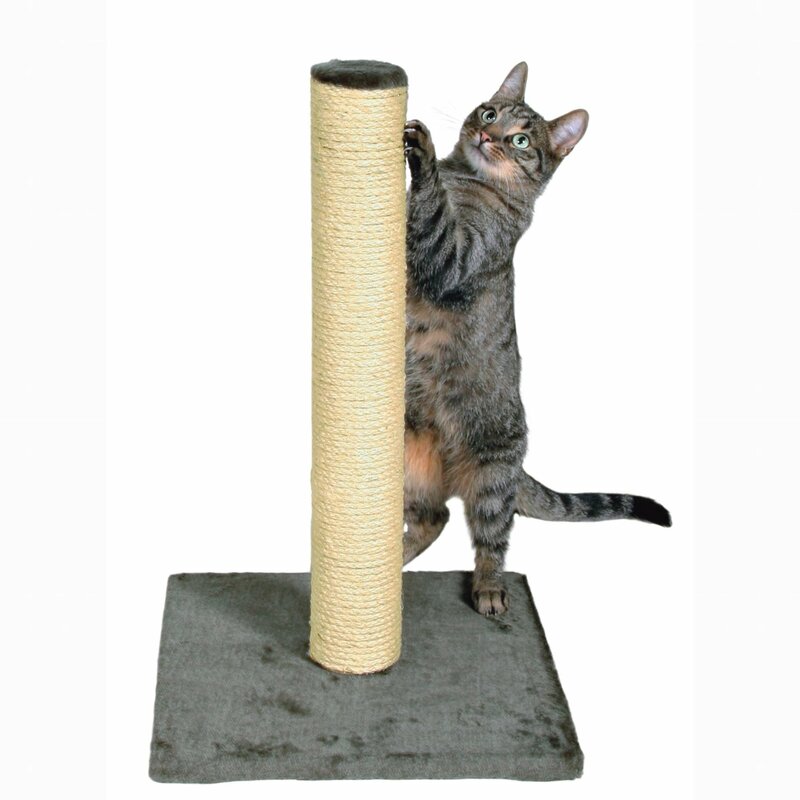 Old cats may not retract their claws so well and they may begin to catch on carpets or furnishings. Keep an eye on these so that they do not become overgrown or begin to curve back into the cat’s pad. Cats are very good at hiding when they are not feeling well. Owners need to be a little bit like detectives and pick up small clues that the cat may be off colour or not as he should be. Changes in coat, changes in body posture or changes in behaviour may all be signs – check with your vet if you are at all worried. 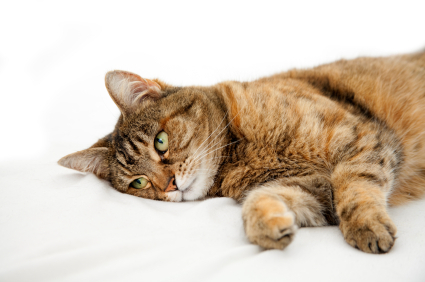 Keep an eye out next week on our Facebook page for our blog how to care for your cats teeth!